Relax everyone. Just a little joke. This month’s Daring Cooks Challenge was to poach something, as in cook in nearly boiling water. Jenn and Jill have challenged The Daring Cooks to learn to perfect the technique of poaching an egg. They chose Eggs Benedict recipe from Alton Brown, Oeufs en Meurette from Cooking with Wine by Anne Willan, and Homemade Sundried Tomato & Pine Nut Seitan Sausages (poached) courtesy of Trudy of Veggie num num. Of course I had to make a few adjustments to the challenge recipe. I wanted to take every step utilizing the best technique possible to make the final dish perfect. First was to sautee the mirepoix in butter. Then deglaze the pan with about 2 cups of carmenere and 2 cups of beef stock. To that was added a bouquet garni of thyme, rosemary, tarragon, and bay leaves. I also tossed in some crushed garlic and some peppercorns to the sauce. This was simmered over medium low heat until reduced by well over half. 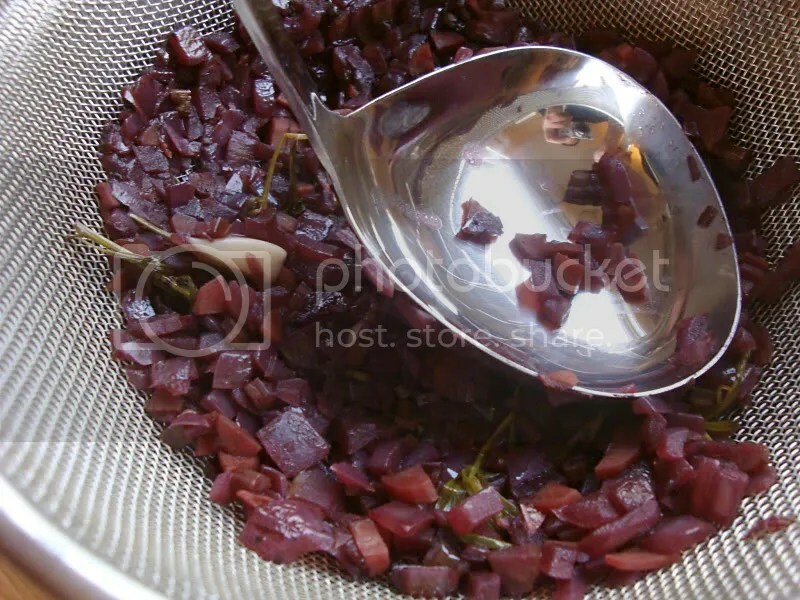 The sauce was then strained through a fine mesh strainer and reduced a bit further. A must when making sauces like this is to use the back of a ladel to squeeze out every last drop of goodness from your sauteed and simmered veggies. I took it this far before finishing with just a few tablespoons of beurre manie. Then I rendered some bacon lardons. Not just any bacon either. 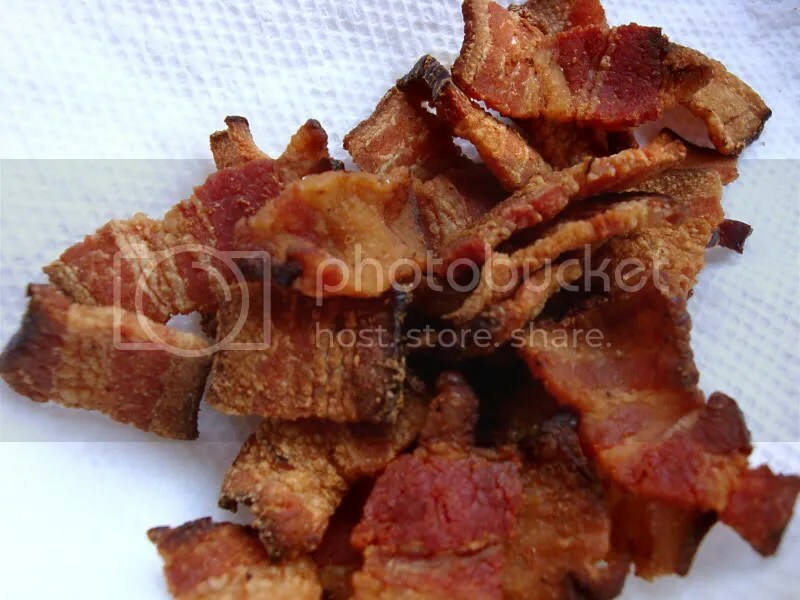 I get this great thick sliced “Ranch style” bacon at my local butcher. Mr. Prime Beef has been my go to butcher for about 6 years now. This past week they were written up in the Anchorage Daily News. I even shared the article on Facebook. Only problem is now I go in at 2 pm on a Monday and there are almost 15 people in the place. It was kind of funny though, I walk in and get served right away. Being a regular has its advantages. Using the rendered bacon fat and bit of butter, I browned up some pearl onions. I had a red wine sauce reducing and pearl onions spattering in fat, it was at this point I felt like I was cooking something decadently French. You do the same and tell me how it makes you feel. The bacon and onions were set aside. Next was mushrooms. I quartered button mushrooms and browned them in a bit of the reserved bacon fat and butter. 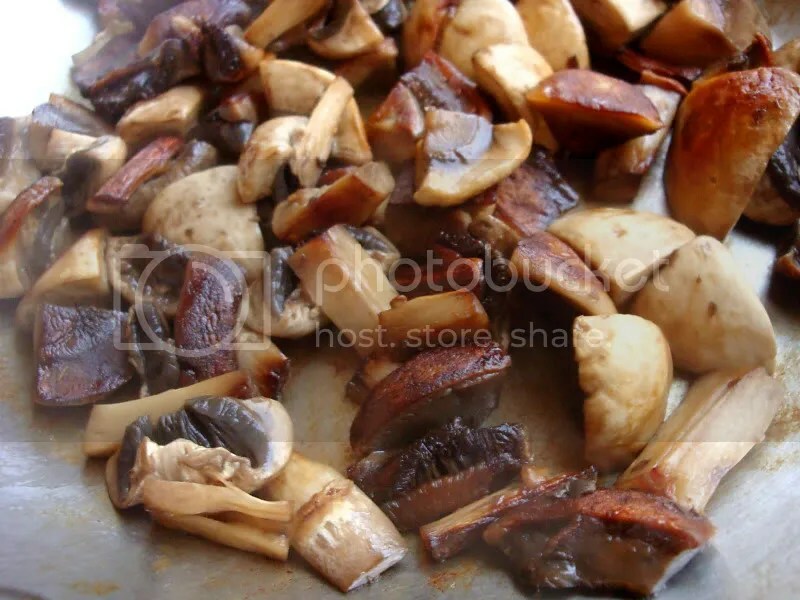 The trick with browning mushrooms properly is to put them in a hot pan with your fat of choice and DON’T TOUCH THEM! At least until you can tell they are browning on the bottom. Then shake or stir and repeat the process until you have a bunch of caramel colored nuggets. Now for the poaching. 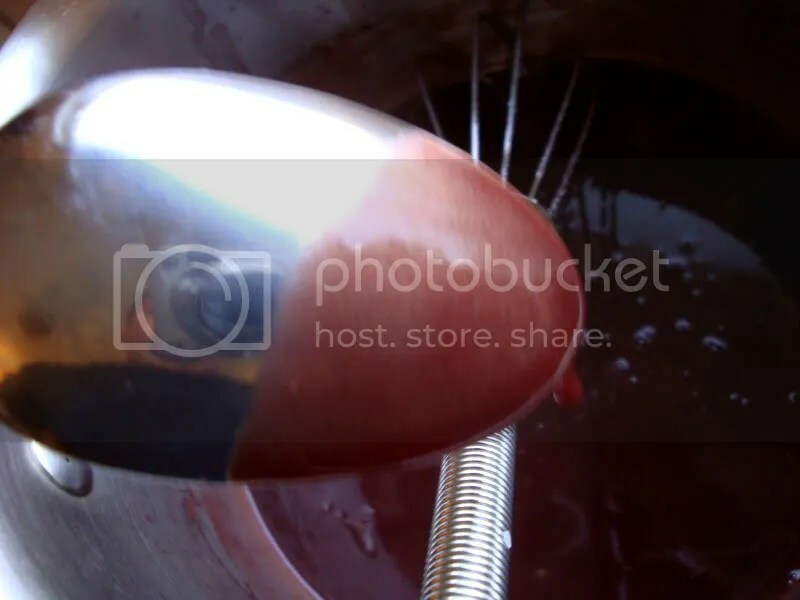 The challenge recipe calls for poaching the eggs in the wine. I was concerned as to how that would affect the sauce and how it would color the eggs. So I went for poaching in water with white wine vinegar. I am also not a fan of the swirl technique. 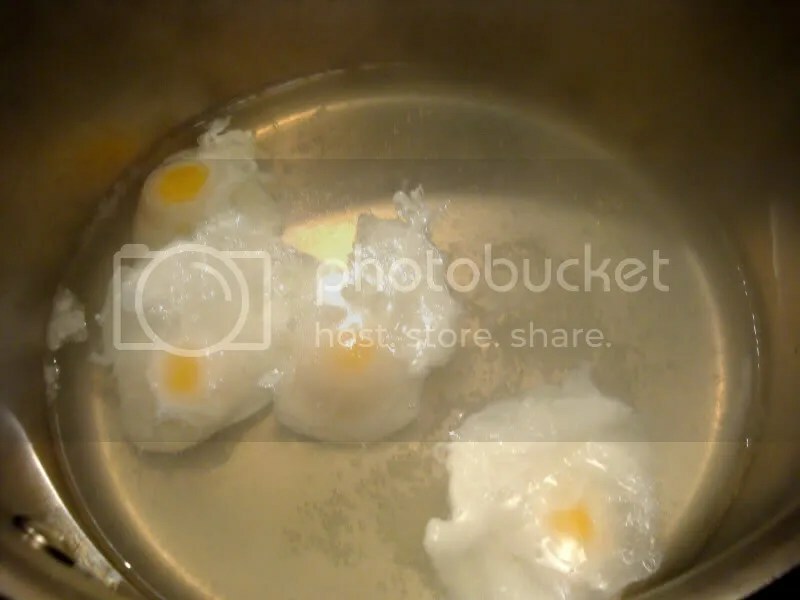 I just crack the eggs into a coffee cup and gently submerge the lip of the cup in the water before slowly pouring the egg into the shallow pan of barely simmering water. Three minutes later and you will have a perfectly soft poached egg. Pull them out with a slotted spoon and let dry on a paper towel lined dish. I almost forgot, I can’t stress this enough, use the freshest eggs possible. Fresh eggs will stay together in the poaching liquid. Eggs that aren’t, will turn your poaching liquid into egg broth. The rest goes pretty fast. Brown up slices of baguette in some butter. Reheat your bacon, mushrooms, and onions in the wine sauce. Top the baguette with an egg and sauce as you like. I drizzled some of the sauce off of a spoon around the plate for kicks. I was especially pleased with the sauce. It had an amazing flavor and gloss that just looked out of this world. The eggs turned out just the way I like as well. Wow was my first reaction upon tasting. Not your normal bacon and eggs that is for sure. Check out all the other Daring Cooks that posted this month here. ~ by climbhighak on December 14, 2010. I love that you made the oeufs en meurette – ever since I first made this dish it has been a favorite of mine. And your photos of your completed dish are gorgeous!! Simply beautiful execution of this dish. I must say that this looks AMAZING!! The whole egg thing for me was new, so Eggs Benedict was daring enough, but I’m definitely trying other versions of this delicious technique. Can’t miss Oeufs en Meurette, you made it look heavenly! This looks delicious, and I learned something new from your blog today – beurre manie. I hadn’t heard of that before, but it sounds like a really useful tool to have in one’s repertoire! That 2nd last photograph is stunning and I’m astounded that you can make brown food look so good that really is impressive. And the process step by step pixs are so clear and professional. Excellent work on this challenge. I did the eggs benedict recipe in this Challenge, but after the holidays, I want to do this one. Yours looks divine! 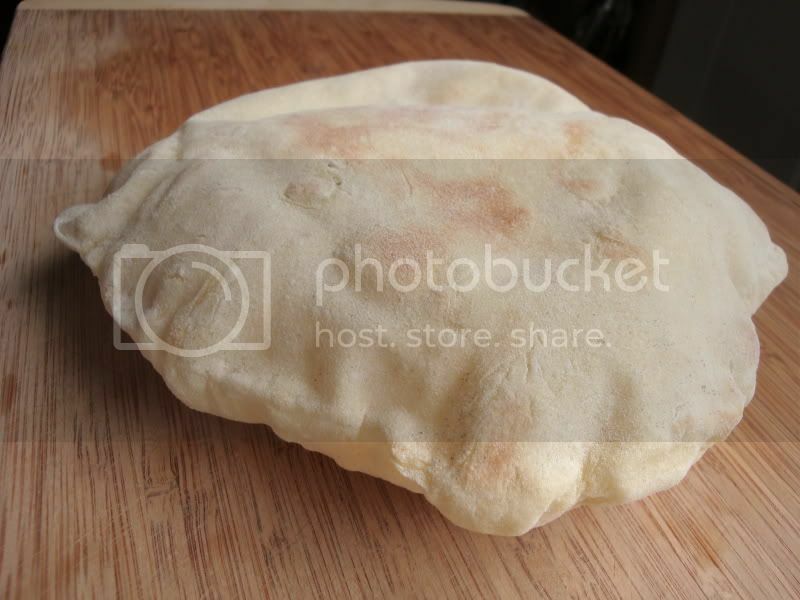 Between your photos and your amazing description of the process, I can practically smell and taste this delicious dish through my computer! Awesome, awesome job!! I think that second last photo is the most dramatic and beautiful one of the whole challenge. It would sell cookbooks! I really wanted to make this recipe, but I don’t like mushrooms, so I skipped it. I think I have to go back and make it though, maybe with extra onions and bacon, because you really can’t go wrong there. Oh my gosh yours look incredible! You were very wise in not poaching the eggs in wine – I wasn’t so clever siiigh. Your dish looks amazing and it sounds like you really put a lot of work into makingn it so perfect! Robert I am so bummed I didn’t make this challenge – bought all the ingredients (I was going to make deep fried poached eggs), but preparing my Jan DC challenge and other stuff got in the way 😦 However, I am living vicariously through your mouth watering photos (I will agree that the second to last photo is unfreakinbelievably amazing and I would give anything to have it in front of me right now). Phenomenal job, as always. 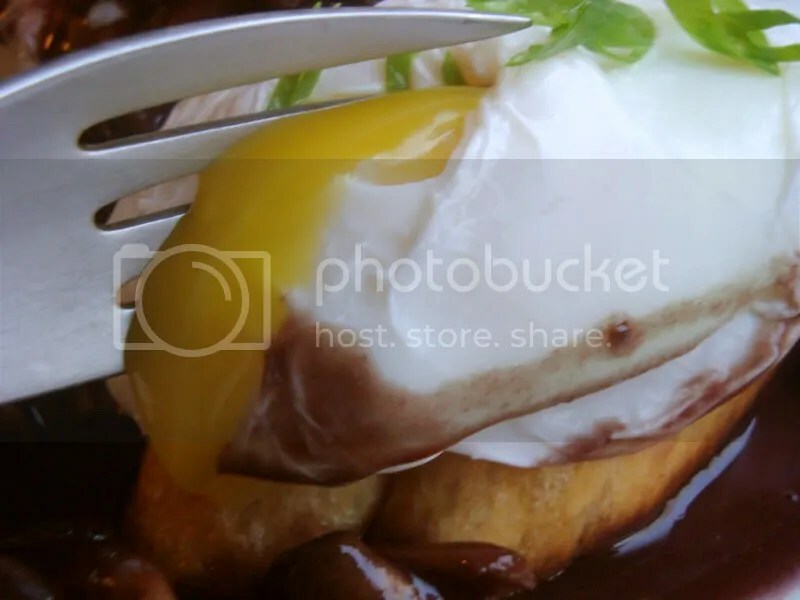 Robert – Your version of Oeufs en Meurette looks amazing and is going on my list of must-dos! Beautiful photography also. Happy Holidays! Spectacular job – your finished dish is amazing! Wow – that final dish looks like a work of art!! Amazing job on the challenge! Your oeufs look phenomenal. That composed dish could be the cover of a cookbook. Just glorious! I love the sauce – just like a good coq au vin, but with crisped bacon, making it even better. Oh yum! 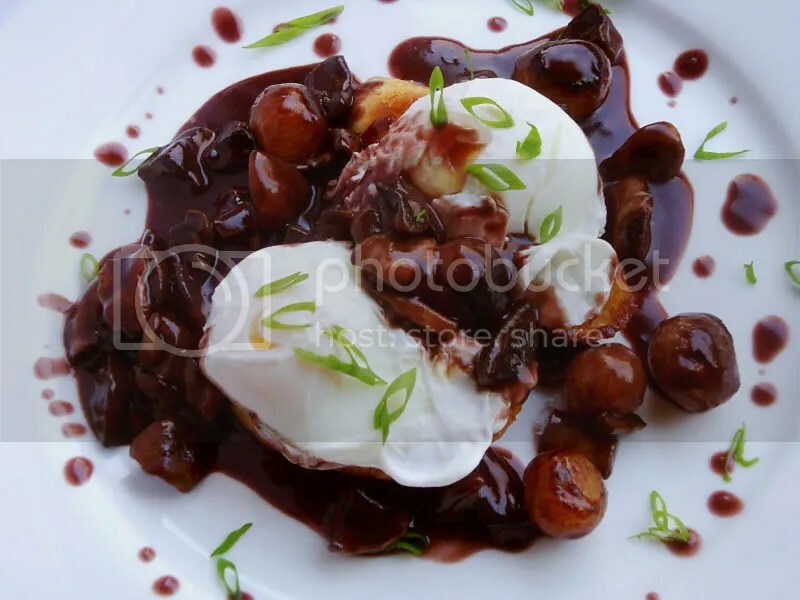 I loved this dish as well and don’t tell but I didn’t poach my eggs in wine either. Your plating is AMAZING! Just looks perfect. 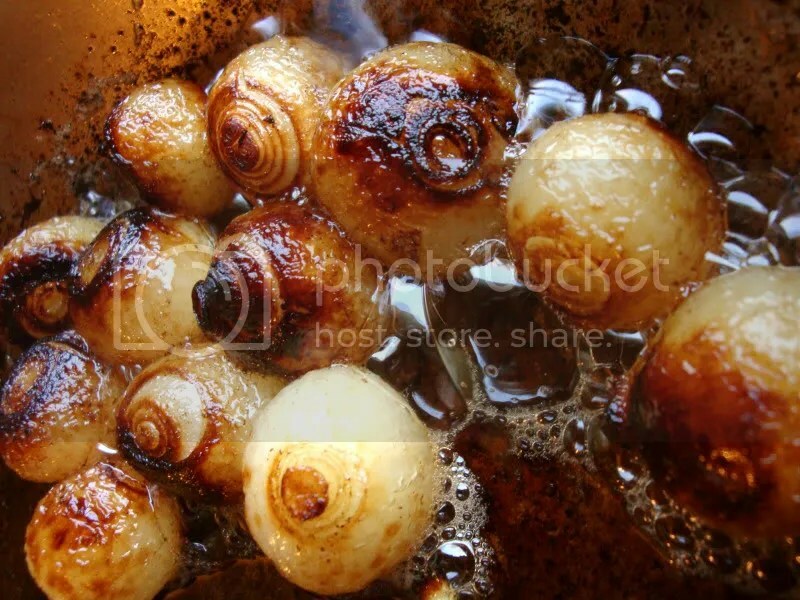 I love the pearl onions picture, and the final dish. Lucky you to have a butcher…not any really around me except the grocery store. This dish looks gorgeous!!! The sauce looks so rich and delicious. I love that this is an egg dish that could be served for dinner. Great job with this challenge! I’ll say. What a stunning dish! I love the deep, glossy sauce and the beautiful plating. A great read too. I’ll definitely have to try this one out. Robert, Thanks for the welcome to Daring Cooks. Green chile eggs benedict is actually very good. It just takes a little time to get that slow cooked flavor. If you make the green chile the day before, you can pull it off for breakfast. I love your take on the Daring Cooks Challenge and your photos… beautiful!